Most Iodine supplements use weak formulas with synthetic vitamins as fillers. Peak Performance offers one of the healthiest and most potent source of iodine from raw organic kelp. Iodine is vital for normal growth and development of the body and plays a very important role in the functioning of the thyroid gland, which secretes thyroid hormones that control the base metabolic rate of the body. A deficiency of iodine can cause symptoms like frustration, depression, mental retardation, poor perception levels, goiter, abnormal weight gain, decreased fertility, coarse skin, constipation, and fatigue. 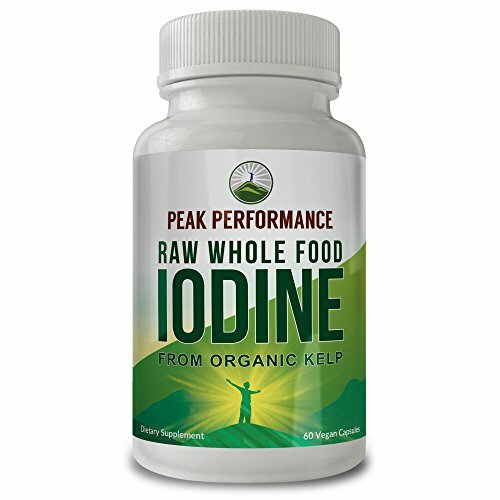 With Peak Performance Raw Whole Food Iodine, you'll get a pure source of Iodine derived from organic kelp. Rest assured, you are consuming one of the healthiest and most powerful Iodine supplements to help you enjoy great health and achieve your peak performance every day. DON'T BE FOOLED BY CHEAP IMITATIONS! Most Iodine supplements use weak formulas with synthetic vitamins as fillers. Peak Performance offers one of the healthiest and most potent sources of iodine from RAW ORGANIC KELP. HIGH POTENCY & MAXIMUM ABSORPTION WHOLE FOOD: Raw whole food is better digested and assimilated into the body. Great for Thyroid Support, Hormonal Balance, Immune Support and Increased Energy Levels.